Several months ago Glagoslav Publications contacted me for the purpose of editing a novel they were planning to re-publish. When I saw the manuscript, my initial response was very emotional. In my hands was a book that was bigger than life – Khatyn, written by Ales Adamovich, translated into the English language and considered a cultural heritage item, sought after by many World War II researchers. I remembered how a very long time ago I encountered this book for the very first time. Back then I read it without the full understanding of what the implications of the work were or could have been. Today, from the position of a certain life experience and knowledge, I feel compelled to relay my thoughts about editing Khatyn. First of all, before I started, I had sought to obtain the original text so as to ensure accuracy of the translation. And from the first pages it became clear to me that the English translation, while being realistically accurate, had also been censored. Despite the brilliant work of the translators some thirty years ago – Glenys Kozlov, Frances Longman and Sharon McKee – some parts of the novel were removed or changed on purpose by the supervising authorities. There’s no Iron Curtain today, the freedom of speech knows no limits, and a more sincere attitude towards historical truth has been re-visited. In other words, there’s no need to play hide and seek. Therefore, the new edition of Khatyn in the English language will have none of that. It will be a sober, truthful book, as intended by its author. In this renewed edition of the English translation, all missing parts have been restored. Another important objective while editing was to preserve the feel of the Byelorussian language (the original language Khatyn was written in) and the English language of the time, all while keeping the text’s integrity and continuity intact, and maintaining the pace of the narration. For that, among other things, I decided to re-word names of people and places to phonetically reflect the Byelorussian language, and preserve such words in the English translation as ‘Alsatian’ which has been taken out of common use in the modern English language since early 1970s, but was a widely used term to identify a breed of a German shepherd dog in the 1940s and during the post-war years which is the time of the events in the novel. It is my hope that I’ve done the job to the best of my ability, and should there be any errors related to my work – they will remain on my account. Half way into the novel, my bravery began betraying me and I had to take a break. Khatyn is based on the war archives and witness testimonies of a few survivors who managed to escape destruction. Albeit written into a story of a fictional – although based on a real person – character of a partisan boy, documented testimonies of what was done to women and children, began to wear heavily on my nervous system. I don’t think I will ever be able to comprehend genocide; it’s just something that doesn’t fit into a sane brain of a regular person. Yet, those responsible for Holocaust of Jews and genocide of Byelorussians along with other European nations that experienced Nazi ethnic cleansing, were no monsters at all. They were functionally normal people, believers in a certain ideal, a certain model of the world for them, and they tortured and killed for that. This was their job. And perhaps because they were humans, their crimes cause such agony to us when trying to understand the mechanics of human psyche and the condition of the soul in this…. There can never be justification and pardon for what they did. Four years ago National Geographics released a documentary Scrapbooks from Hell – the Auschwitz Albums, based on the discovery of photographs from the concentration camp. The documentary ends with an exposition of the deceased as remodeled in an artwork of the memorial complex in Auschwitz, and the thought that we will never know what happened inside the gas chambers. We won’t unless we read Khatyn. Writer and journalist Ales Adamovich collected outnumbered witness records (just imagine – of one village only one elderly man managed to escape!) and told the story of the perished people, for us to know what had happened, and how that what had happened in Belarus in 1943 related to that what had happened in Auschwitz. Khatyn is not written to scare away or to only shed tears. The novel is composed from a standpoint of a young person, and youth is daring, youth is dashing, youth falls in love and romanticizes everything, even war. Youth is courageous, youth is bright, and youth is ever present on Khatyn’s pages. Youth is the future, and the reason why Ales Adamovich did the work – Khatyn is written for the next generation to stand strong. The book is ready. It will be officially released on June 22, 2012 to commemorate the Nazi attack on Belarus and the beginning of what is known there and in the entire post-Soviet region as the Great Patriotic War, a deadly national fight that lasted four years. Glagoslav Publications once again draws attention to this work of non-fictional fiction, unabridged and unadulterated in its current form, and to the records that had been sealed, and to the thoughts of the author who had witnessed the war before you and I were born. 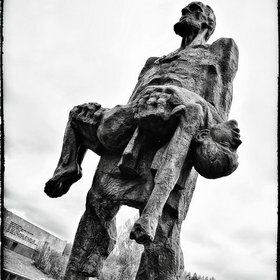 Khatyn is a must know story, to never forget. Till this very day the story repeats itself elsewhere as brutal massacres shake the world once again, to awaken us from a dormant state, to see the condition of mankind and its desperate cry for change – for one Khatyn is too many. Copyright Camilla Stein ©2012. All rights reserved. © Camilla Stein. All rights reserved. Enter your email address to subscribe to CSReview and receive updates by email. Sign me up to Camilla Stein Review!